Let’s face it, the city of Montreal is the place to be in the video game industry. You just need to walk around downtown to realise that you can find several large studios from well known companies such as Ubisoft, Warner, EA and even Gameloft to name a few. However, Montreal is also a place where you can find a fair amount of small studios that are ready to face (hopefully) the cold hearted world of the video game industry. From that ever growing list of indie companies, some happen to stick out a bit more than others. Their secret? There isn’t one. You need to know the industry, what’s selling well these days, you need to know how to adapt it to your needs, and of course transform it into something different. It sounds like a simple equation, yet it’s anything but simple. For some of them it’s a matter of sheer luck while for the others, it’s an ongoing arduous process of tireless efforts and outstanding work. The result? To be considered one of the best independant video game company in North America. We all want the same thing, and that’s ok. Lately, there has been several Montreal based games released onto the market. We’re talking about games released on PC, STEAM and even home consoles. Released since then end of September, JOTUN is wowing the galleries with stunning visuals that capture a breathtaking universe. Having seen Will Dubé on all possible medias in the last year, it was possible for any of us to follow JOTUN’s progress closely. Even today, it’s difficult to believe that the game was produced in such a short amount of time. Very impressive. 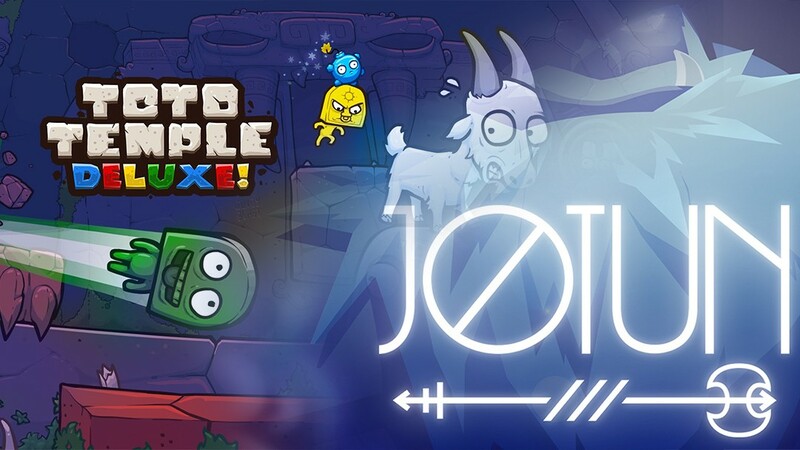 To learn more about JOTUN, click here. If you’re looking for a party game, stop right there, you won’t find better! Toto Temple is a fast paced, aggressive and challenging. Don’t mind the colorful visuals and simple universe, you’re in for a fight. Battle your friends and be the one who gathers the highest score… By having the goat sit on your head. Yes, that’s right. To lean more about Toto Temple Deluxe, click here.